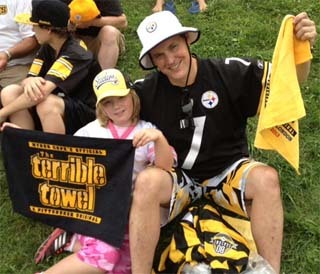 The Steelers 2014 training camp begins this Friday, July 25th when the players report, and Steelers.com has all the info you need when you report! What’s the camp schedule look like? What’s the weather report for Latrobe? Where can you stay if you plan on spending more than the day? What kind of fan activities are scheduled for Steeler Nation? What’s the layout of the St. Vincent College and how do you get to the field? What about parking? Food? and where do you go for medical assistance if needed? You can find all of that out right here! “We went to St. Vincent three days – Friday for the night practice, where Kathleen got lots of autographs; On Monday I got Ben’s autograph on my son’s jersey. I told him it was my son’s favorite jersey and that he had passed away December 30th and had been featured on his site. He looked at me and said, ‘I am sorry. (Pause) I am really very sorry!’. It was very nice for him to acknowledge it all in the pandemonium that was surrounding him at the time. My son, Connor had always wanted Ben’s autograph but never got it. I teared up after and felt like I accomplished something for him. That jersey will be framed with a plaque honoring my son in our basement, which is heavily laden with Steeler memorabilia. Thank you, Mr. Roethlisberger for your sympathy. Thank you also for all the time you spent, in spite of being banged up, signing autographs. You made one little girl’s, and a couple of her buddies’ day.” – Patrick Williams, photo above with Kathleen. Where do you send your favorite photos and fan stories from training camp? Just email them to us at [email protected] and we’ll be happy to share them with the rest of Steeler Nation!